An old adage compares the process of mergers and acquisitions to trying to complete a large puzzle when your right hand and your left hand have never worked together. To put it mildly, mergers and acquisitions revolve around a plethora of moving parts. Further complicating matters is the fact that there are suddenly two companies and additional stakeholders that now need to fairly and seamlessly work and communicate together in order to bring the deal to completion. But what happens after the deal has (seemingly) crossed the finish line? And what is post-merger integration? Here is a comprehensive look at the importance of M&A Integration, process, best practices, post merger integration software, and the true post merger integration meaning. Here you can also find a free post-merger integration checklist you can download and use! Post-merger integration (PMI) is the process of bringing two or more companies together with the aim of maximizing synergies to ensure that the deal lives up to its predicted value. More specifically, post merger integration problems in mergers and acquisitions often cause deals to fail, or, at the very least, result in the inability to extract true value from deals - no one wants a deal that looks good only on paper or results in a semi-integrated company. With this in mind, post acquisition integration planning must begin at the beginning of the deal, and best practices, integral team members, and integration plans must be established before the deal closes. One of the top post merger success factors is placing value around integration from the top down. At the commencement of the M&A process, a company’s executives should gather all of the potential stakeholders involved in a deal’s due diligence process—bankers, lawyers, consultants, etc.—and begin communicating from the start about the details of the post-merger integration. Better yet, each and every communication in the diligence phase during m&a integration should also have an eye on the post deal integration period. Post-merger integration best practices prove that the people doing diligence should become part of the integration team in order to retain and revise information without redoing work or engaging in redundant tasks. When using the same individuals for diligence and integration, there is continuity, which is invaluable during the often chaotic time of deal closing and post acquisition integration. The benefits of this continuity are numerous. Consider, for instance, the time it would take for the diligence team members to do a full data transfer to the integration team. Would every bit of information really get transfered? What about the overlooked notes on notepads that do not get passed on? Clearly, even the best intended data hand-offs would end with some gaps and oversights. In addition, let’s say that in the best case scenario all of the information from the diligence team does get to the integration team - will the members of integration team really go over all of this work? Most likely not because they will be under the gun and strapped for time, which, again, will result in gaps of knowledge and oversights. Consequently, the best, and the most efficient, way of integrating is to have overlap between the diligence team and the integration team. This model also increases the likelihood that the team will maintain its momentum and capture synergies, or “low hanging fruit,” of the deal that are found within the first 120 days. More and more M&A practitioners are understanding the importance of m&a integration planning, but integration operations (even those at major acquirers) still often miss the mark because the all too important “people” factor can get lost in the shuffle of modern business life. This misstep can lead to loss of employees and clients during the very critical early days of integration when competitors tend to go after both employees and clients of the target company. With this in mind, integration practitioners need to be ready to execute and communicate on day one important information about targets, employees’ positions and benefits, and the future of the company - obviously Human Resources plays a vital role in the “human” piece of integration. HR cannot do it all, however; your acquisition transition plan will not be successful if it doesn’t take into account change management. The first rule related to change management best practices is to make change management its own role. Some of the benefits of having a change management expert on your PMI M&A team are: the buyer gains valuable information about the target company (which can help maximize potential deal value), the target company feels cared for and employee morale/buy-in improves, and secrets are revealed (i.e. information comes to light that current leadership may be totally unaware of ) - all of which will help avoid major and costly problems. One final note when it comes to putting together a M&A integration team and acquisition integration plan: when selecting an integration leader, recommendations should come from members of the diligence team - remember, strong integration practices and the valuing of post acquisition integration comes from the top-down. Data and Knowledge - This area includes a plan on how to integrate knowledge such as customer, product, and services data. Technology and Systems - Integrating companies need a strategy for combining their technology and systems. For example, if both companies use different CRMS, which CRM will they use in the future? Internal Policies - How will the two integrating companies handle internal policies such as new employee training, salary changes, employee exits etc. ? Business Procedures - This area includes the strategy behind future business operations such as sourcing new business and future mergers. Company Culture - Company culture is the backbone of any business. If one company is an 8 AM - 5 PM Monday through Friday, and the other company has flexible hours and work from home days, there are sure to be clashes. Before integration is complete, the two companies need to decide on the company culture that will emerge post close. Organizational Structures - This area includes organizing department structures. For example, will the two human resources departments become one, or will each one take on different responsibilities? Products/Services - Before the companies integrated, they each had their own set of products and/or services. They will need to decide whether to continue, combine, or eliminate the products and/or services offered, as well as the branding associated with them. There are four typical types of post acquisition integration. Absorption - an absorption integration is when the acquiring company completely absorbs the target, including all processes, organizations, and procedures. Symbiosis - Integration only occurs in certain areas to help meet the goals of the merger or acquisition. Preservation - The target company is mostly kept at self-governing, however, some integration may occur with financial information. Holding - This is when the acquiring company holds ownership of the target company, but they don’t integrate with each other. What is Post-Merger Integration Process? Post-merger integration is the process behind combining and restructuring two businesses following a merger or acquisition in order to maximize the deal’s value. M&A Integration planning must begin at the beginning of the deal and goals need to be re-evaluated regularly throughout integration. Teams are also assembled around aligned cross functional goals. This enables everyone to have a big picture view and eliminate common cross functional dependency issues. A kick off meeting should be held at the commencement of the deal. At this meeting, a list of people to be included in the integration phase must be generated. During this stage it is critical to clarify governance and determine the operating post merger integration framework for how teams will work together, such as setting up meetings, managing dependencies, and sharing info. While due diligence is not historically categorized as a part of PMI, successful m&a integrations keep a sharp eye on integration during diligence. Tools such as DealRoom’s m&a software, help companies plan for PMI before the deal closes. Pre-close (again not technically part of PMI, but essential to a positive outcome) - synergies should be reviewed and confirmed and teams and team leaders should be established. Hold a post-merger kick off meeting. Institute communication channels and reporting up via weekly or monthly stand-ups. Teams review and evaluate the post acquisition integration throughout constant short iterations. This makes it easier to realign a team and their goals as new information arises. In order to have a successful integration, and avoid common post merger integration risks, a thorough plan has to be in place before the deal closes. Teams need to create a game plan and M&A integration checklist for the employees, set goals, track progress, and have open communication. What is Post Merger Integration 100 Day Plan? 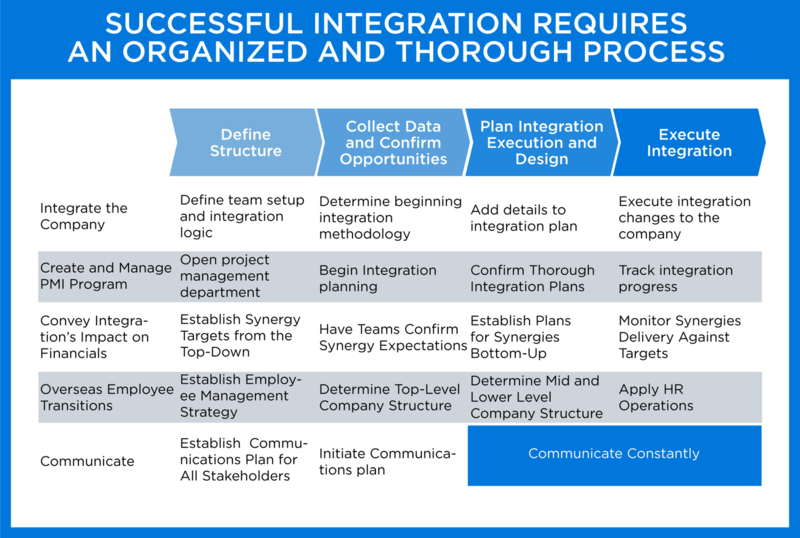 An integration 100-day-plan goes along with the traditional approach to integration. It is with the mind set that teams can follow an integration playbook, and that after 100 days, the integration should be at a certain point. However, many teams are no longer following the traditional methodology of integration playbooks, and are following an Agile strategy methodology instead. How Long Post Deal Integration Take? There is no set time frame for how long post deal integration should last. Every deal is different, therefore, every post deal integration has its own rhythm. Integration can take months, if not years to fully complete. However, no matter what type of deal is taking place, integration planning should begin early, alongside diligence, and before the deal closes. A post merger integration checklist (or m&a integration checklist) is a step by step agenda to keep teams on track in preparation for a merger or acquisition. You can also think of the pmi checklist as the backbone for the entire company integration plan, since it will include all departments and personnel, and goes way beyond the typical post merger integration 100 day plan. The checklist needs to include plans for the following: hiring processes for short and long term needs, redundancies, turnover, employee retention, M&A IT integration, technology, systems merging, tracking employee performance, and more. It is also important for those in key roles to take a post merger integration questionnaire to help them understand and align goals. Click the link below for an instant download of m&a integration checklist. There are many different strategy types of post acquisition integration, but here are some general post merger integration steps and best practices to follow. While having a separate company integration team is not possible for all companies, there are some things smaller corporations can do to make sure the key integration players have a balanced and manageable workload. In order for post acquisition integration tasks to receive the attention they need, honest conversations between workers and Corp-Dev need to be had. What can actually be accomplished? Are there day-to-day tasks or projects that can be handed off to other employees while certain people work on integration? In some cases, companies might consider hiring temporary workers and building this into the integration budget. The integration budget needs to be looked at very closely and with realistic eyes. Lack of clear expectations can bring chaos and negative emotions to mergers and acquisitions. Luckily, expectations can be set by prioritizing tasks for the business integration plan, that lead back to the key objective. More specifically, the power to ask the right questions, at the right time, can be harnessed through daily, or almost daily, sequencing and prioritizing with the target company. This will be scary at first for the target company, and perhaps for you, too, as the post acquisition integration practitioner, but the benefits are immense. Most importantly, this style of sequencing keeps the focus on the objective and only the tasks related to that objective; unnecessary work is also eliminated, thus reducing deal fatigue. Although the target company might initially be weary of the daily contact, they will ultimately reap the benefits of focused integration practices and experience the mental joy of seeing the list of tasks become smaller and smaller. Another advantage of sequencing, stemming directly from the above points, is that the increased contact with the target company about priorities will allow critical conversations to come to the floor earlier in the life-cycle of the deal. Limiting priorities (everything cannot be high priority) allows stakeholders to see the reality of the deal (what will and will not happen in the future) and reduces churn because it becomes clear early on that not everyone will get what he/she wants out of the deal. Just as individuals react with a wide variety of emotions to shifts in their personal lives, they also follow a pattern of emotional responses to variations in their work lives. Although models of the change curve use slightly different terms, experts agree when workers are faced with major changes at work, they often travel from denial, to anger, to depression, and then, hopefully, move to stages of acceptance, hope, and commitment. In simpler terms, when changes are implemented or mergers and acquisitions take place, morale often tanks and workers become preoccupied with fears and doubts and productive work suffers. Agile can help with this as seen through some post merger integration examples, namely the Disney-Pixar acquisition. This m&a integration was especially successful because employees did not feel as though their entire worlds were changing in a short period of time; rather changes were implemented slowly and methodically based on their priority ranking. A strong company morale is vital to any post merger integration framework. While a tool is never the cure-all for any team’s M&A problems, the right tool and m&a software can speed up the integration process and produce valuable data for integration teams. VDRs and project management platforms designed specifically for M&A, such as DealRoom (for deals 50M and greater) and FirmRoom (for deals under the 50M mark) can literally keep all parties, and new coworkers, on the same page. Executives can no longer simply rely on Microsoft Excel when there are more efficient tools and technologies. In fact, DealRoom’s post merger integration tools can be used to super-charge your integration needs as it is a process management tool with an overlay for due diligence management. When the buy-side or banks use DealRoom’s post merger integration software, they see increased collaboration and a massive cut-down of emails. When DealRoom’s use is continued to integration and post-closing activities, its data can be reused and the tool itself can help the integration team avoid duplicate work - a common pitfall that slows the entire integration process and wastes valuable employees’ time. More specifically, items can be tagged during the diligence process for integration. Successful M&A integration practices don’t overlook the fact that focus on change management, as alluded to above, is a vital part of the M&A integration plan. Many stakeholders are fooled into overlooking the power of strong change management and integration practices. Indeed, sometimes when conducting smaller deals, the buy-side can get away with sloppier integration methods and disregarding the important leg work related to proper change management. However, as deals get larger, ignoring change management will certainly lead to post acquisition integration problems. The crux of the matter is big deals demand robust change management practices. Experts recommend that around the six month mark, employees should be given a climate survey. Again, the data collected should be analyzed and the feedback should be delivered in a report to upper level management. This will allow the company’s leadership to take a look at what is going well and what still needs to be addressed, or worked on further, in order for the integration process to continue to move in the right direction. While there has been a growing desire for deal “playbooks” over the last few years, the notion of playbooks has begun to take on a more negative connotation in industry due to the fact that no two deals are exactly alike. It is impossible to have a post merger integration template for every aspect of a deal because all deals involve different people, emotions, products, and risks. Even if your target company looks very similar to a past target company, you must consider that a current deal could be different because you, as the acquiring company, may have changed. One could even go as far as to say that the desire to follow an M&A integration playbook is dangerous to the deal itself as it can cause tunnel vision, hurting big picture alignment and customer relations and failing to recognize the uniqueness of each deal - all of which will jeopardize maximizing the value of the deal. Instead of turning to playbooks, try to shift your mindset to being a bit more Agile, or flexible, and consider frameworks and other post merger integration tools. While playbooks are not ideal for the fluctuating/irregular world of M&A, basic game plans and frameworks are relevant. It is both practical and human nature to want to look at past deals and see what may or may not apply to your current deal. Within this post merger integration framework, you will generally want to know how you will begin the M&A process and who will be involved, but all players need to acknowledge that the exact approach is what everyone will be working together in an Agile manner to uncover. Through discovery and analysis, the post merger integration framework must allow for taking time to understand the customer and the target company, which is a major benefit of Agile - teams become efficient and much more customer/people focused. Poor post deal integration practices are the number one cause of post merger integration failure. DealRoom helps you stay away from common post acquisition integration mistakes, and increases the chance of a successful post-merger integration.The platform enables users to plan properly from day one and the very beginning of the diligence process. Teams have access to all the files and data prior to the deal closing, allowing them to spot areas of concern and plan accordingly. The Dealroom’s post-merger integration software also allows users to set cross-stream dependencies across multiple functions. All deal team members can see the progress of the deal as it unfolds, in real time. This enables employees in key roles such as managers, department heads, and human resources, to have access to information and updates on a regular basis. DealRoom also has a post merger integration plan template for users to download. Ready for a better process that helps maximize deal value? Request our post-merger integration software today.